The Minnesota Forecaster: Will April Start Acting Like April? Will April Start Acting Like April? Most of the natives, except perhaps not winter/snow lovers, are ready for winter to bid adieu. Might we see a rollercoaster before the month is over? 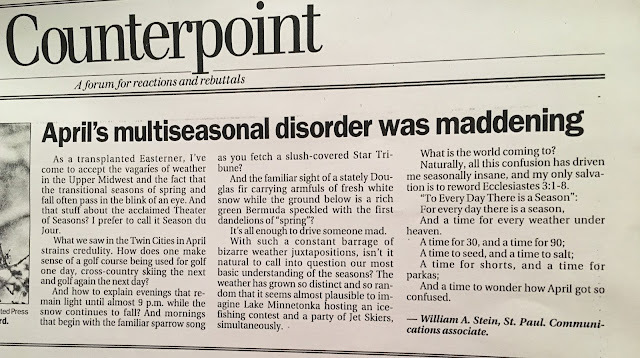 This is a commentary that your trust blogger had published in the Star Tribune 16 years ago. Perhaps it may yet ring true for 2018. Very nice memories.... my FB community and I are a bit tired of "and here's another thing" scenarios as Mother Nature/Old Man Winter keep coming into the room after storming off or quietly tiptoeing out. Time will tell, and your counterpoint shows that 'history repeats itself' more often than not! Thanks for sharing the piece from the past. Let's see what this week brings. P.S. It has been a great winter season for your blog!!!! Nice article, Bill. That brings back memories. I recall April 2002 very clearly. I lived across the street from Hyland Lake Park Reserve in west Bloomington. Throughout the month of April I would come home, grab my skis and go skiing. I recall skiing when there was still plenty of light past 8 PM. What an experience! Thanks. I hardly remember that April! I'm a bit confused, why is the 18Z GFS showing over a foot of snow for the metro Friday into Saturday when most everyone is taunting a warm up this week? Much colder air is supposed to move back into the TC later Friday into Saturday. Possible major snowstorm Saturday. Check out this morning's NWS forecast discussion. Ok 12z Gfs showing over 2ft of snow, too funny. GFS shows 33” over a part of MN this weekend. I think it is tired of the snow and messing with us. 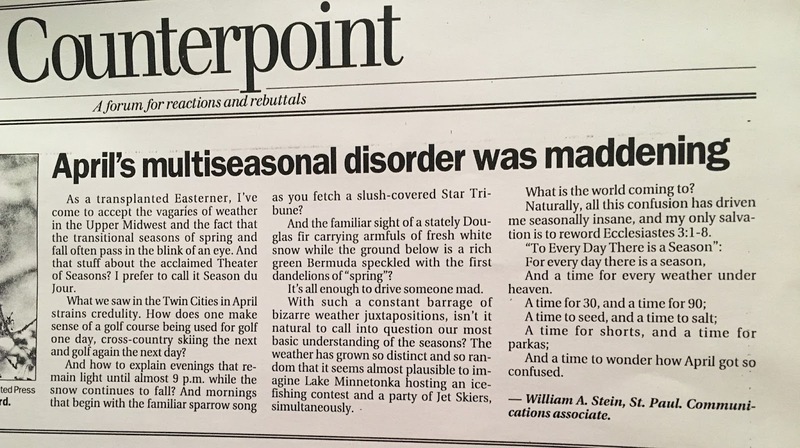 Nice article Bill, you are quite the writer! I think we should start taking these models showing large amounts of snow a little bit more serious instead of laughing them off now that were within 4 days of said event. Current 6Z GFS from this morning has 19" at MSP for this Saturday/Sunday, that's now the last 6 runs showing heavy snow in Minnesota and in most cases either in or near the metro with the heaviest snows. Too soon for a video? NWS still hesitant with this. They are thinking the heaviest stays to the north of the cities with rain and snow down here. All this talk for an inch of slop. Count on it. Numbers for my area just dropped significantly. Which area are you in? Thanks! Watches going up west with almost insane totals for this time of year. 20 inches?!?!? This storm alone would threaten all time April snow totals, let alone from a single storm. This thing isn't even on shore yet. I still think the GFS is insane to predict almost 3 feet of snow for parts of MN. No way that holds up. And not even one Met from Novak to Dahl to Huttner is talking about it, and we're roughly 3-3.5 days away from when NWS is saying a changeover to snow. Paul Douglas mentioned "some slush" in his blog last night is the extent from our locals. Either their taking the wait and see approach or they believe nothing significant will happen. I'm a bit baffled by Dahl normally he's gong-ho on snow and in his blog all he talks about is the servere awareness week, not a mention of a flake! Watched Ian Leonard at 6. He showed the three storms that are on the way including the large one this weekend which is over the ocean around Alaska. He didn’t get into much detail but so far talked more rain for the metro with snow north. Again, not s ton of detail and I’m guessing he is waiting for it to hit land. At this point, Reg flags galore with this storm. Latest models(00Z run)still have heavy snow on the metro or just north. NAM- just coming into picture as it is a short range model, but their heavy snow area lies just north of the metro currently. 12Z American models(NAM & GFS) coming in very snowy, each have 10-14+" for the metro area, north to south! Buckle up! IMO watches starting flying this afternoon or early tomorrow morning. I would normally agree with this idea, maybe a bit later. But, this system, as shown by models, would require quite a few things to come together nearly perfectly. I personally am thinking to wait with headlines on this for a bit longer and see if things are holding strong by tomorrow night or if the models implode on themselves. Either way I hope the large amounts verify! My phone weather app just jumped their totals to 8-13" if that means anything for west metro. Mark my words some places/counties will be under a Blizzard Warning for this storm in Minnesota. This has the earmarks of a fierce winter storm(but in the middle of April). The snow and wind will not disappoint on Saturday! Whether it pans out or not, these are some of the most impressive model runs for the whole season. This will be fun to watch. 12Z Canadian is in and it dumps 12-18" over the entire metro. Plenty of model consensus as of now. Meteorologists always they have greater forecast confidence when there's good model consensus, can't get any better then this with the NAM/GFS/CANADIAN 48-60 hours out! This is just getting way too exciting!! I know that mets are "scared" to forecast this thing, but it is so fun to watch it play out. Interested that Novak stated on Twitter that he wouldn't touch this with a 10 foot pole, but I know he is all over it. He also stated that there are lots of red flags with this one. This is what makes it fun! Without these issues, the interest in weather would be very small. Love it! And what I really love are the models that are BRINGING IT! They can't be ignored. Neither can my dancing. I am dancing like crazy. I want this to break all kinds of records!! Bring it! I would also love a video soon--and include the red flags that Novak is seeing and may even be in place up until the storm arrives. Pretty please? Nice to see the 12z Euro run came down to earth finally. Looks to me all models agree in a 12+ swath of heavy snow, around 50 miles wide roughly. It's hard not to get excited about the possibility, but there's just no way this happens. Not to Minneapolis. Not in April. Well, Joel, I think it's possible. Look at the article/chart in the links below!! Anything is possible, and it's still pretty cold out there. Time shall tell. Joel is just trying to get a reaction. It is easy to say what Joel said, but the only evidence he has is that the odds are on his side based on historical data. It is April!! He is just historically wrong about the possibility. And wrong about the Minneaplis comment historically. Got your response. Now bring it! First, I didn't say it wasn't possible. Second, even the professional forecasters are being shy about it. Third, I would love nothing more than a big snowstorm, but they are extremely rare in Minneapolis, even moreso in April. Fourth, I would hazard a guess that there have been MANY more times that a storm forecast to bring a lot of snow in April brought mostly rain instead. So I'd say history is on the side of it being mostly rain. Fifth, you've misinterpreted my intent. It makes much more sense to be pessimistic about snow chances in April and be pleasantly surprised than to get my hopes up for a huge snowstorm and end up with rain. I mean, seriously. Minneapolis has had TWO snowstorms in April...in recorded history...of more than 10 inches of snow. TWO...going back to 1891. Averages are made by the extremes. I disagree. If you get 10 6" snowstorms, the average is 6". So every storm is the same size in your world? Strange. I'm sorry, but when did I say that? One more thing. I have never ever posted here to simply 'get a reaction'. NEVER. I've been posting here for years, always using my own name, unlike most. I post my thoughts and questions. I don't appreciate being called out as a troll. I support you, Joel. You're a valued contributor! Boom! Right on que, called that Winter Storm Watch, the ingredients are there for a nasty storm and you can't deny the model consensus. According to the NWS reading the wording the metro core looks to be in a toss up with wintery precipitation, if you want the heavy snow totals we need to get that mix out of here pretty quickly and transition to all snow faster! Still a lot of play in the models I believe, grab the popcorn! Joel, no worries. I appreciate that you use your name regularly and you are valued. I guess when you said "there's no way this happens", it just sounded like some of the anonymous posts and it caused a response. You explained it well, but I think the evidence shows it could happen AND it is seeming like it is more and more likely. Bring it!! Exactly. I'm one of the anonymous people who often posts because I can't remember my password for a name I created.... so I took the post 'at its word' and just wanted to put some info so that we have April reference points. If Joel vanished, it would be like YOU vanishing, PWL and many others on this blog. Hope it never happens. I love this blog and most of the humans on it! Let's see what happens this weekend. The most glaring red flag in the depicted track of the 500/700/850mb lows. All guidance shows the tracks well south of MN over so. IA If this is the case, it just doesn't make sense to place the heavy snow bands well north of these tracks. Gut feeling is that guidance either moves these mid-level lows northward with each successive run or they will nudge the heavy snow bands south into Iowa, so. WI. I will gain more confidence, if/when these mid-level lows track closer to so. MN with future model runs. Until then, I'm nervous about forecasting big snows. I’m really surprised they posted the watch this early. Really trusting long range models. Waiting for Novak to weigh in. I agree! It's 54 hours before the potential event may start!! Novak posted at the same time I did. Appreciate his insight. I was thinking the same thing. Accumulating ice of any real significance (I'm thinking the way it can be on the east coast) is not common here. And spring seems an even odder time for that to happen. I'll ask Dr. Novak. We're planning to do a video tomorrow evening. Its official! NAM is on another planet at this point. Not surprising, NAM is starting to trend south with the precipitation shield; more in line with where the mid-level lows are located. In turn, DRY air flows into MN from the east. This is not good if you want snow/ice. In other words, time to pump the brakes on this storm. Bust potential increasing, especially from the MSP metro on north. What does that mean Novak? The NAM has us nailed in the metro with a ton of snow. Can you explain more? The video tomorrow will be epic. Have the entire family ready with popcorn to watch Who would have imagined this kind of drama in April? Will it bust, will someone get 20”+, or will we be skating on the roads? Personally hoping the NAM trend of moving it south continues. I really want to golf. I know. We should charge for this one. Look at the NAM 60 hr. total snow map from this evening's run. It clearly has pulled the snow much, MUCH further west than earlier runs. For instance, it does NOT paint a band of snow across central MN & northern WI. Sure, after 60 hrs. the 00z NAM does extend the snow further east, but I usually lose confidence in the NAM past 60 hrs. What this tells me is that MSP will be fighting dry air as this storm system tries to pull moisture north into MN. Plus, with the surface & mid-level lows so far south, it leads to the idea of a potential bust. Now, I'm not saying it is a for sure bust, but I simply believe we need to pump the brakes & not get too excited yet. Storm comes ashore tomorrow & we will be able to measure it much better. BTW, if I'm living in SD and/or NE, I'm bracing for a monster snowfall. BTW. Based of the 04/11/12z maps of the GFS the #2 analog cold season storm was 03/31/1985 according to the CIPS site. The result 14.7" inches here in the metro. Some of today's maps look with familiar with centers of circulation over IA. Something to note, Euro has been increasing its totals for the past 3 runs in the metro, and has brought the bulk of the heavy snow which was positioned in SW MN into the metro... Yikes! First, my position is I don't want any more snow. Enough is enough with this crap and let's move into spring. Frost depths are still 20" in some places. There's no way corn will be "knee high by the 4th". Definitely a late planting season this year. However, I do love tracking significant weather events and watching them evolve. Latest 00z Euro is concerning. Upper level height falls centered over IA & a clear swath of heavy snow across so. MN/WI. However, I'm still having a tough time believing that this band of intense snow will fall 300 to 400 MILES north of the surface low track. I can't wait for today's model runs to come down. Storm coming ashore now. Well the first GFS run aftering the sampling (12Z) still doesn't disappoint for the metro, anywhere from 10-16" in the metro. April beast mode!! nearly every model is the same, wide swath of heavy snow in western mn right through the middle of the state but yet Novak isn't sold... what gives? might need a video for explanation. Hell even the goof on the roof is buying in on heavy snow. Video planned for 7 tonight. Gfs followed suite with king Euro! Hold your horses says the Canadian. Shifts this way south, leaving the north metro with a measly 4 inches while the south metro gets pounded. Deja vu? I live in the south metro so at least for now its looking good. I'm more concerned when the system will start moving due north, because the latest Euro just shifted it further west which means more snow, and NAM has also been hinting at this as well. 18z NAM is out. Too soon to put more gas in the snow blower? Blizzard Warning issued in western MN, all for nothing according to Novak, time will tell i guess. Well dry air is really starting to show up on the NAM 3k. Looks like little to no snow for the metro. I hope i'm wrong but that is what it is looking like right now. Storm drifting south like Novak predicted. Rochester will be in the bullseye with this trend. Big snows don't happen in MSP! The bullseye was on St. Cloud not more than 2 runs ago, now it is on MSP. Trends put it south of MSP by tomorrow. Bullseye totals have actually increased slightly. Please stop with the "big snows don't happen in MSP" until you have scientific data to prove that. 2010-2011 literally had not one, but TWO snowfalls over a foot in MSP. Apparently looking at data is difficult. I will never understand some people. In other news we are closing in on this and things are starting to heat up. Curious to see just how well models handled this, or if they all simultaneously were terrible. @Bill, please ask this of Novak. Last night he referenced the NAM pulling back the moisture to the west and MSP fighting dry air with a bust potential,so that's why he is hesitating on big snows in MSP, so fast forward almost 24hrs the NAM is showing MSP in the bullseye for 16-24", so now that it shows this is it believable or he's going to disregard and jump to a different model because it shows less snow? Just curious because if your going to make a argument/statement one day because it was falling inline with your thinking and now it's going totally opposite to your thinking do you just simply disregard it and move on to a model that suits you better. Also Bill please ask Novak if this storm still smells(his words on Twitter). He asked us to wait till storm was onshore, so we did and most models have had st least one stab at it and in some cases two model runs and ALL show anywhere from 8-20" in MSP, so was is he still gun shy? ha ha. Great name for a snowstorm. If it starts Friday night, we could call it the Friday the 13th Weekend Snowstorm. All those maps in 22 minutes and no snowfall forecast numbers for the Twin Cities? Did I miss something?? So if we're not going to get big snow how much is Novak forecasting? A fair question. I just read the NWS forecast discussion. It lacks serious confidence for everywhere except western and southwestern Minnesota. The discussion reeks of a huge bust elsewhere. Perhaps it's just the NWS playing CYA so no matter what happens they can say that that is what they forecasted? Thanks for the video guys. But my reference of the metro being in the bullseye was from the 18Z NAM(on the pivotalweather.com site), I have no idea what the NAMnest is in which Novak referenced, maybe Novak can explain the difference that what I'm looking at is totally different then what Novak is looking at and their both the NAM model? Confused! Anyhow this storm is either big bust or big epic fun to see it play out! Brilliant video tonight guys. Great job explaining all of the complications forecasting this and looking deeper than what simple model looks show. I always learn something. NWS has a warning out now for the TC metro. 9-15 inches for St. Louis Park. I hope that compacting works big time. Thank you for the video. If this monster busts, then it will be interesting to see how NWS grades itself. Chris @ WCCO said 5-10", but his graphic had the southern metro in 10-16" and the northern metro in the 6-10" area. Great video guys. Most of the time I agree with Tom and his ideas. But this time I have to take exception, particularly at or very near 10:52 into the video. First lets look at the wind barbs within the jet streaks that he talks about. The wind barbs are the L shaped figures with long and short lines in them. The bottom of the L figure is the direction that the winds are coming from. After that each long line represents a 10knot increase in wind speeds, the short line within the L represent 5 knot winds. Notice that he highlights the Jet streak coming out of New Mexico which normally means dry air, but notice that winds are originating from the NW and are being driven to the bottom of the trough where they pick up air from the gulf of Mexico. That picks up moisture rich air and lifts it north into our area. Now that jet streak travels just to our east to where the map shows it curving to the east north east. At this point Tom with his red line shows that dry winds are being advected into the system from the northeast. However the opposite is true, the wind barbs within the jet streak shows air being driven from the south leaving the system and being ejected out to the NE. This is happening along the MN/WI just to the east of us and is critical. Mother Nature always wants to be in balance. Keep in mind we are talking the upper levels of the atmosphere. Now air is being advected out of the system at 300mb and kicked out to the NE. That air needs to be replaced from somewhere in order for mother nature to keep the column of air in balance, but it can't come from above for the air is to thin, so therefore it has to come from below that level. So as that air gets replace from below, it causes lift in the lower levels and thus precipitation. Because of the streak being just to our east and air over Eastern Minnesota being lifted to replace the upper level void, I have gained a great deal of confidence that the Twin City Metro will receive significant snow if not historic. Real good stuff Randy. Love it how you are paying so much attention to the Jet Stream & streaks. Often, many people, including 4casters will simply look at the QPF and lower layers of our atmosphere. However, the Jet Stream is most critical. Just took a look at the 04/13 0z runs. All models are now showing a foot+ for the metro, Including the UKMET which shows 1.57" of precip after 850mb temps drop below 0° At an average of a 10:1 ratio, that equals around 16" Even with compaction, I suspect that dynamic cooling will be taking place. Going with a wide spread of 14 to 18" in the metro, and that could be low. WOW Randy WOW! !...First of all awesome stuff explaining the winds and air and lift....if what you say will happen that's one helluva of a storm. You sure your not a NWS meteorologist in disguise. You really need to be in these videos....@Bill will you consider a special guess Randy in a upcoming video?...I suspect this will be the last winter storm of this season but come November you should invite Randy....just saying. This thing is a monster. And would be considered a monster at any time during the winter. Not even sure what to call a monster storm in April. Mega Monster! Just can’t wait. BRING IT!!!! I’m going and hoping for two feet. Why not? It has the potential. BRING IT!! In looking over that list, it is no wonder that people of my age have a false sense of Minnesota being snowy and getting big storms. Nine (NINE!!) of the top twenty snowstorms happened between the ages of 8 and 12 for me...January 82 through December 85. Nine in just short of four years is insane. 10-18 inches now predicted for St. Louis Park. un.be.lievable. Winter Storm Xanto? Ugh, I hate these stupid names. Agreed. Winter storms never had names til some network or weather outfit started naming them. I don't mind stuff like "Armistice Day" blizzard or "Halloween Blizzard"... but to name a storm on a regular day of the year.... I agree with you, 'ugh' indeed! The closest I could come up with was the "Friday the 13th" storm but today it looks to be mostly rain. I still like "April Bigdaddy"....not that I'm biased or anything. but.. but.. but.. MSP does not get big snow. Is this a jab at someone or a proclamation or ???? Please explain. Thank you. The snow hasn't yet fallen. 10000000% sarcasm... Nothing more. Looking forward to a dumping. occurs ahead of the next event Tuesday night into Wednesday night. remain some 10 to 15 degrees below normal by the end of the period. Pump the brakes everyone. The main thrust of energy/snow is still 24+ hours away. Lots can happen in between. I'm nervous as hell right now. I don't like the DRY air to the north. Would it be any surprise if there were a razor sharp 12"+ snow gradient near or just north of the MSP metro? Also, the surface & mid level lows are displaced well south of MN over IA & MO. This should scare all 4casters & make them scratch their heads. For snow lovers, the hope is that forcing in the mid to upper layers of our atmosphere will overcome this obvious red flag. Why are the forecasts so gung ho about it with the obvious red flag? QPF shows it. That can't be denied. Don't get me wrong...this looks like a heavy snow scenario for much of southern MN/WI. However, this storm gets delayed some & this is going to catch people off guard. The main snow event, for most of us, may not get going until Saturday afternoon when the mid level pivot (deformation axis) pinwheels over southern MN. The problem is that much of the public likely thinks that all of the snow will fall tonight & into Saturday AM. Well almost every forecast I've heard from local TV Mets to radio and NWS has between 2-5" by Saturday morning, it's hard to believe you when your the minority. Also Novak your doing the public a disservice by waiting to the last minute, you haven't put out a snowfall map or updated your travel impact map from 36 hours ago. I say enough with your red flags and pumping brakes and give us a forecast already. Ha! Love it. You are right though. The NAM NEST that showed minimal accums yesterday in your video is dropping 15-17in over the metro now. Every single model I've looked at with their most recent update from the NAM GFS EURO UKMET CANADIAN, I don't see how MSP doesn't get 12+", I'm astonished with how Novak sees it otherwise, and I'm not talking about just this morning it goes back to Wednesday when models back then were showing big snows in MSP or just north. Canadian models are bad news for the north metro. Misinterpreted. My bad. Things still look on track. To be honest and fair to Novak, who usually 'nails it' with these winter snow totals, I've been thinking of the video/his map early this week, his 'smell test' comments all day because NWS 'promised' I would wake up to pouring rain this morning..... and then it was dry. They told me it would rain in the night, and it did not. Then I heard a met on local radio say that by 11 it would be storming.... and it hasn't in my neck of the woods in the metro area .... just looked at radar and it's almost noon with no big blobs headed my way. Now, I still do believe snowmageddon is coming, but we need to cut Novak some slack imo. He does a very good job 99% of the time, and I say he has the once-a-winter chance to say, "I am not touching this storm." I love all the discussions, etc., and I as much as any would enjoy seeing his snow total maps because many of us know how good they often are. But if he doesn't want to put one out, he doesn't have to. I think the lack of the map just shows how weird it all is right now. That is my two cents. Please do not all bash me. It's just my two cents. Novak just put up a map on FB you all who desire it! That 12Z NAM 3km sure has that storm drying up. Only one major swath of snow. Novak could be onto something here. Not sure exactly what you are looking at. The 12z 3k nam has 12-16 inch accumulation for the area. Snowing in St. Paul. Was supposed to be all rain still. Weird mix now in SW Minneapolis. Rain with big snow flakes. Trends appear to be boats south on the short term HRRR and RAP models. South as in South metro getting the brunt of it. Hard to tell since they only bgo out 18 and 21 hours respectively. I noticed the big snow "blobs" (not really flakes...they were exploding on my windshield!) falling too. I was in eastern Saint Louis Park and driving back to Hopkins just now, and the temp dropped from 40 to 36 on that 5 mile drive west. No snow, no rain in downtown. Temp: 40. He’s predicting 8-12” with 50 mph winds—and another chance of snow on Wednesday. I heard someone comment this morning, "I just hope that when summer finally arrives, it's over a long weekend..."
Non-event huge BUST shaping up for north metro. NAM showing barely 2 inches! You can see 13.8" near downtown, then the north side of the county it quickly drops to about 5"
However, the gradient isn't nearly as bad as some, more so for the north metro this time instead of splitting the cities. 10:1 vs Kuchera - Check Kuchera. NWS reported hail in Chanhassen. I don't think this is hail; it's graupel. snowband from Redwood Falls through the Twin Cities and Eau Claire. likely see the heavy snow axis shift south. NWS point forecast is silly. 7-17” for SW Hennepin if you add the numbers up. Really enjoying the debate and comments on this storm. Way too complicated for a hack like me. Still rooting for Novak since he has been the outlier and frankly I’m done with the snow for the year. I do see some substantial storms breaking out over southern MN as I type this. Probably means more ice pellets or whatever that stuff is that has fallen. With the point forecast use the average between the values vers adding the max range valued. The point forecast uses the NDFD which outputs an actual value such as 3.2". The NWS turns this into a range to help cover small differences in qpf, making the range 2-4". The larger the value the larger the automated phrasing system makes the range. When it's a short period of snow this works well, but causes confusion when the snow covers multiple time periods like this storm. I really enjoy reading the comments on this blog. But I find it rather annoying if I dare say that a few of the bloggers are listed as “anonymous“ . It would be nice to have distinction between blog post so it doesn’t look like somebody is talking to themselves over in the corner. Does that make sense? Also it would be nice of people filled out a bit on their profile as I believe I have. I’m just a snowplow guy that likes to follow this stuff closely. All in all enjoying all the comments. Thanks! Glad you're enjoying the blog, Bob! I've tried to get people to move to a Facebook page but some of the primary contributors aren't on Facebook so it's been a challenge. And I feel the same way about the Anonymous commenters. It's a struggle. Lots of moisture starting to stream into southern MN. Any idea when it might change over to snow? I don't know anything about a southern shift that some commented earlier but to the naked eye the heavy snow zone is setting up well north, like St. Cloud on north. I'm sure this won't be a popular statement with many so early in game but I'm calling low end bust(only maybe half the snow that is forecasted we will get), tonight's precipitation coming in as mostly sleet/rain mix not snow then a forecasted lull with models trending the next wave south with time, sure smells like Novak will be correct! It just got quiet here in SW Minneapolis. Looked out the window and it's snowing. All snow in Golden Valley and accumulating! And... NAM 12k is out to lunch again, showing 30+ for the metro. Fox 9 weather person (do not remember who she was) talked about a push of air from the north that will dry out the impact to the north metro. She had totals of 6-10 for the southern metro (9 PM forecast). Not suggesting she is right, but that southern move Novak talked about may be happening. Hard to say. 0Z run has actually pushed the snow north again, if anything I would say the snow is further north than what any models were showing on the 12Z and 18Z runs. NAM,NAM 3K,and REG Gem are out,20 to 30" across the metro is what they are showing. I would suggest looking at the total snowfall totals off the HRRR'S last complete run, than look at the reflectivity at the end of the same run, very impressive indeed. This storm showed its hand in yesterday's model runs. The real show won't begin until tomorrow afternoon & will hit hard thru Sunday. Anything that falls this evening & overnight is only a precursor/appetizer. Unprecedented snow potential. I just can't believe this. NAM shows the trough tilting negative & the jet streak increasing in intensity later tomorrow into Sunday with comma shape. If this verifies, it is a true signal of monster snow numbers over so. MN/WI. Any guesses on snow totals? The latest Euro model is frighting.. Due to how long it will be snowing I wouldn't be surprised if this system goes down as one of the top 3 biggest storms ever. Do you happen to have a map? Wow. Every 00z model with a monster here. Incredible. Thanks for the map by the way! The warning now extends through 7 p.m. Sunday for the Twin Cities Metro. Reminds me of the Halloween Blizzard event. Lucky Friday was mostly rain during the day. These predicted totals are "off the charts"....... 9-19 inches predicted for St. Louis Park. I'm with my family out of town in UT this weekend...... lots of de-icing last night to get out of MSP. Will we make it back tomorrow night????? This is unreal! Snowing so hard and the main show isn’t even here yet! I truly don’t think two feet is out of the question! I can hardly handle myself. BRING IT!! NAM is still at 20" for the 12Z. Amazing. No more dry air theory, looks like the real deal coming. So much for baseball, golf, water skiing, etc. Back to ice fishing. Wondering why Carver County isn't in a blizzard warning. Near whiteout conditions in downtown Waconia. Just upgraded to a Blizzard Warning...if that even matters at this point. So far total bust in washington county. The main event wasn't supposed to start until late morning/early afternoon. Looking at the radar, the heavy snow is right on the doorstep of the south metro. No reason to call this a bust at all! According to the radar it should be snowing at 1’/hr instead nothing is falling from the sky except a few stray flakes and graupel. Lol. Give it time, Anon. I had to use a neighbor's house as a landmark to make a turn less than a mile from my house, in town. Blizzard Warning for the metro core. Amazing! The biggest models agency in Amritsar, VIP models independent agency, Independent female entertainment service at Amritsar. Mid-April Blizzard: Historical or Hysterical?